The Affordable Care Act's 2018 open enrollment period came at the end of a turbulent year in health care. The Trump administration took several steps to weaken the ACA's insurance marketplaces. Meanwhile, congressional Republicans engaged in a nine-month effort to repeal and replace the law's coverage expansions and roll back Medicaid. Nevertheless, 11.8 million people had selected plans through the marketplaces by the end of January, about 3.7 percent fewer than the prior year. There was an overall increase in enrollment this year in states that run their own marketplaces and a decrease in those states that rely on the federal marketplace. To gauge the perspectives of Americans on the marketplaces, Medicaid, and other health insurance issues, the Commonwealth Fund Affordable Care Act Tracking Survey interviewed a random, nationally representative sample of 2,410 adults ages 19 to 64 between November 2 and December 27, 2017, including 541 people who have marketplace or Medicaid coverage. 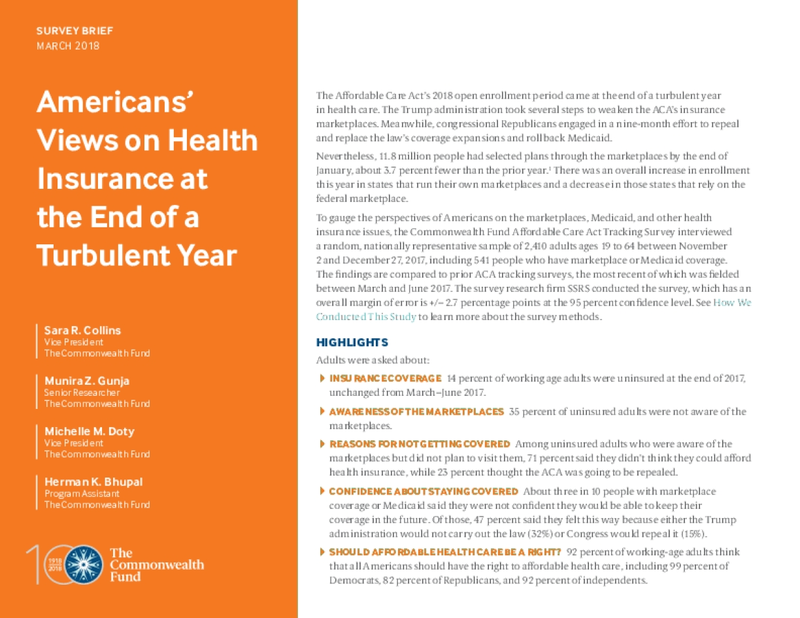 The findings are compared to prior ACA tracking surveys, the most recent of which was fielded between March and June 2017. The survey research firm SSRS conducted the survey, which has an overall margin of error is +/– 2.7 percentage points at the 95 percent confidence level. Copyright 2018 by Commonwealth Fund. All rights reserved.